Randi Sargent is an assistive technology (AT)/AAC advocate and founder of SayitwithSymbols.com and Giving Greetings Publishing. She combines her experience as a caregiving parent with her professional experience in publishing and product development to support the needs of people with speech challenges. SayitwithSymbols.com is dedicated to providing easy to daily living when they can not use speech. Our products are used by family caregivers, hospitals, rehab centers, nursing homes and disability support agencies to enable choice making for people with communication and cognitive difficulties due to aphasia, stroke, brain injury, dementia, ALS, cerebral palsy and autism. Please join our community of caregivers and professionals on the Say it with Symbols Facebook page or on Twitter @SayitwithSymbol to learn more about functional communication supports for people with speech and/or cognitive challenges. "When our son was born with cerebral palsy we were hopeful that he would develop speech but this did not develop for him. Over the years, I have designed countless communication supports using symbols and pictures to help our wordless son "voice" his choices and opinions, and help him engage in our family life. I created SayitwithSymbols.com in 2008 as a resource to empower families, caregivers, educators and health professionals who care for adults and children who do not have effective speech. The curated collection of products we offer on SayitwithSymbols.com are portable, functional and easy to use by caregivers at home and out in the community. Caregivers will find many pre-made visual supports and communication aids as well as the books, tools and software you need to create your own communication books and other visual supports. We used feedback from families and field-testing to design many of the products on this website because we found none readily available that met our needs as caregivers." 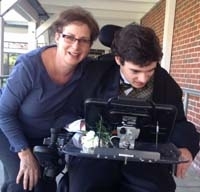 Randi has been creating and using visual communication aids with her son for more than twenty years and is an assistive technology advocate. She is a motivating guest speaker on assistive technologies and has presented to parents, students and professionals at Northeastern University, Fitchburg State University, Easter Seals MA, Federation for Children with Special Needs and other disability support events. Randi is an active Board member on the AT Advisory Council for the Massachusetts Rehabilitation Commission, Institute for Community Inclusion Advisory Board @ U Mass Boston and her local DDS Citizen Advisory Board. Randi served on the Board of Directors of the Federation for Children with Special Needs in Boston for many years and was a contributing blogger on assistive technology for families. Randi earned her MBA from Boston University and dual undergraduate degrees in life sciences and communications from Syracuse University. Most recently, Randi worked as Director of Business and Strategic Development at Easter Seals Massachusetts. Randi lives outside of Boston with her husband and two children. Thanks for being a proactive caregiver. Communicating is caring. This site is dedicated to Graham for his brilliant smile and endearing personality - he is our symbol of love and life.